The first month of the year encourages all sorts of turn-over-a-new-leaf fads but if you're not ready for 31days of animal-free eating and ditching the booze is not for you, why not celebrate Ginuary and all things juniper instead? Here at Cool Places we have a handful of fab places to stay with top-notch restaurants and bars that serve an extensive range of gin, plus there are more distilleries across the UK than ever (such as Half Hitch, Arbikie and Langley's), all creating seriously good versions of the spirit that are stocked in watering-holes throughout Britain. Read on for a selection of producers of the much-loved drink and where to enjoy the tipple in January and beyond. Made beside the sea, this is created using organic pure wheat spirit and is incredibly smooth with notes of fresh orange and lime peel. It also contains locally-grown coriander seed (the first UK commercially grown in over two centuries). Here's our guide to the city. This stylish seaside boutique hotel evokes the maritime spirit of the area and serves quality food and drink. The NAVYÄRD bar has a carefully sourced and sizeable gin list, with over 100 types split over four shelves. Which will you choose? Created with Cumbrian provenance using water from the River Derwent and a bunch of local botanicals, this is one worth trying; they do tours too, for those who fancy seeing how it's done. Our guide to region is here. 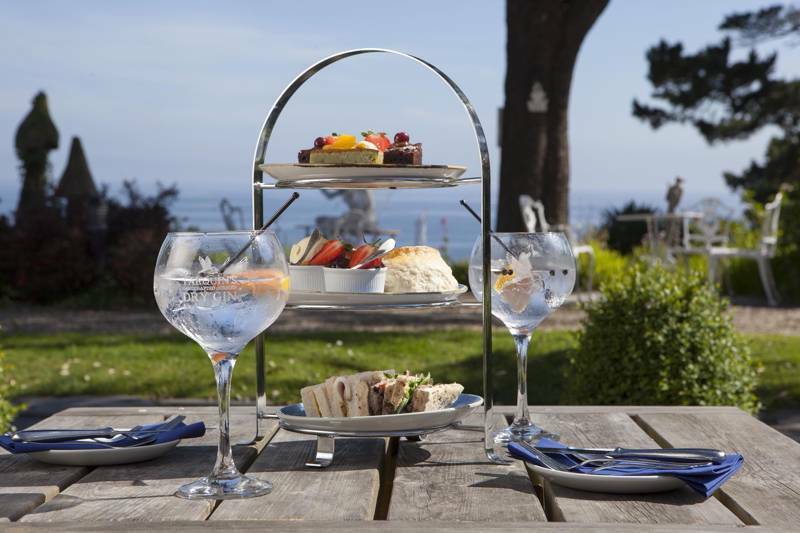 This luxurious hotel tucked into an idyllic bay between Looe and Polperro in Cornwall stocks over 15 locally-sourced gins in its bar, plus there's a host more from other parts of the country. They even have their own creation made at Colwith Farm, Britain's first plough-to-bottle distillery. Cheers! With a take on the classic London Dry, this option is refreshing with a hint of elderberry. Why not mix up a Clover Club, a blend of gin, lemon juice, sugar syrup, egg white and raspberries. They also do a Navy strength variety – watch out! Here's our guide to Dorset. This rather lovely bolthole in Suffolk is offering gin at half price all throughout Ginuary. The menu includes artisan brands such as Bullards Norwich, Curio Rock and Pinkster. What are you waiting for? At the Southwestern Distillery in Cornwall these pot distillers concentrate on seven core principles, ranging from 'innovating, experimenting and taking risks' to 'going back to basics'. Click here for our guide to Cornwall. The welcoming spot in Stratford-upon-Avon has a bespoke gin list for lovers of the libation. Sup on a G+T whilst listening to their live pianist, or how about ordering a gin-based cocktail – buy one get one free on a Thursday. A waterside distillery in South Hams where they handcraft using a 450 litre pot still and the one shot method, citrus flavours alongside numerous exotic botanicals create a balanced spirit. Develop your own bottle at their school, or visit the bar to sample some products. Here's our guide to Devon. This chic hideaway in Kent is home to a renowned eatery and a bar by the name of The Top Deck. Head there and sip on a G+T whilst perusing the food menu. Guests should feel free to mix and match any gin, garnish or tonic to their liking. Chin-chin.